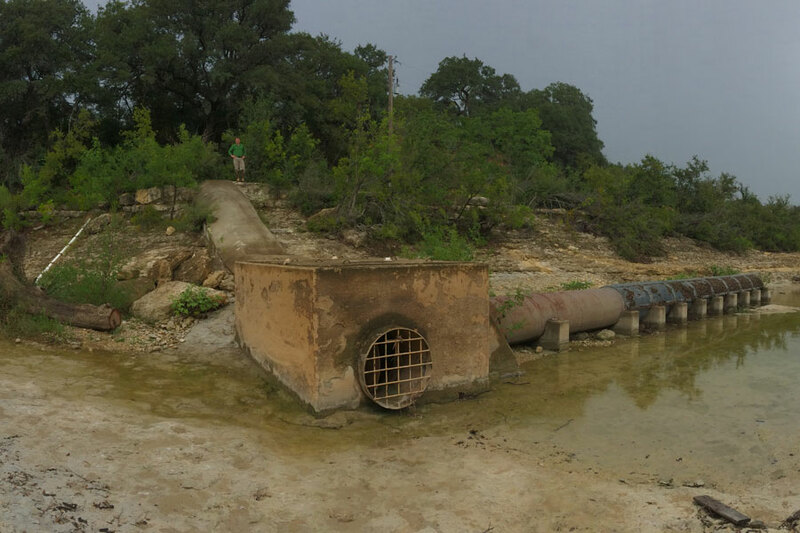 We all share responsibility for the aquifers on which we all depend. Below are just a few easy ways to conserve water both in and around your home. Indoor conservation helps extend water supplies and can be as easy as fixing leaks and choosing water conscious ways to do things. Here are simple, easy steps to lessen your indoor water footprint. Turn off the water while brushing your teeth, shaving, and shampooing/conditioning instead of letting it run. Fix all leaking faucets, showerheads, and toilet tanks. Leaks (even slow, quiet ones) can waste hundreds of gallons every month. Match your washing machine’s wash level to the size of the load you are doing. If you can’t adjust your machine’s wash level, try to wash only full loads. If you’re shopping for a new washing machine, try to opt for a high efficient front-loading model as they generally use less water than top-loading models. Take showers instead of baths. Reduce showering time and install a low-flow showerhead with a water cutoff handle. While showering, you can flip the handle to temporarily stop water flow when not needed. When you need to rinse, flip the handle back into place and the water returns without any fluctuation in temperature. 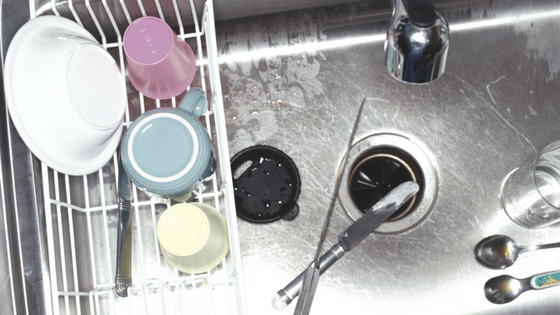 Wash dishes in an energy-efficient dishwasher. According to the EPA, Dishwashers use on average about 9.3 gallons per load, whereas hand washing uses approximately 20 gallons per load. If you must wash by hand try filling up two bowls or basins, one for washing and one for rinsing, instead of letting the water run down the drain. Collect and reuse water before it goes down the drain as wastewater. For instance, you could fill a basin with water for rinsing vegetables or washing dishes instead of letting the faucet run. When finished, use it to water outdoor plants. Install low flow showerheads and faucet aerators. Replace older model toilets with a low flow model that uses 1.6 gallons (instead of 3.5 or more gallons) per flush. Check with your water supply company for rebate programs on low flow toilets, aerators, and other water saving devices. Outdoor conservation helps extend water supplies and can be as easy as fixing leaks and choosing water conscious ways to do things. 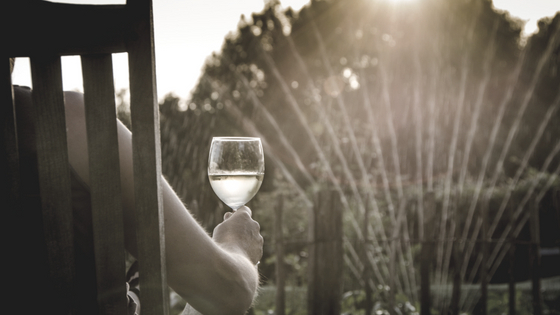 Here are simple, easy steps to lessen your outdoor water footprint. Perform a yearly home irrigation audit to fine-tune your irrigation system. Fix all leaky faucets, pipes, hoses, and sprinklers. Leaks (even slow, quiet ones) can waste hundreds of gallons every month. Remove or pare down your turf grass and instead install native or adapted plants. They are suited to the climate of your area, and Texas natives generally need less water to thrive. If you water with a sprinkler system, make sure to audit your system regularly for leaks. In addition, install water-conserving devices like a rain shut-off device, soil sensors, or drip irrigation for your garden beds. Cover swimming pools to reduce evaporation when not in use, only refill when needed, and check regularly for cracks or leaks. Sweep sidewalks and driveways with a broom instead of using a hose. Use a spray nozzle on your hose with a shut-off valve to cut down on water waste. Leaks needlessly waste precious water and can make groundwater wells & septic systems work overtime. 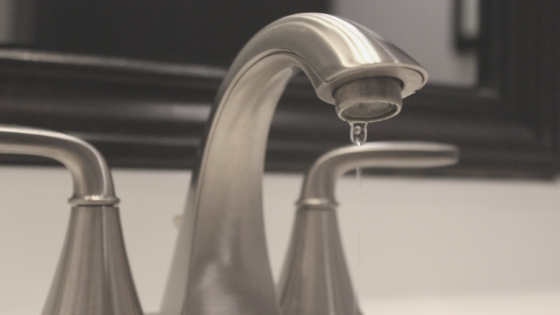 The US EPA reports that the most common types of leaks found in the home are worn toilet flappers, dripping faucets, and other leaking valves. Regularly checking for leaks and monitoring unusual water usage are two easy ways save water in and around your home. An easy way to check for a leak if you have a water meter is to watch the meter level before and after a two-hour period where no water is being used. If the meter changes at all you probably have a leak. 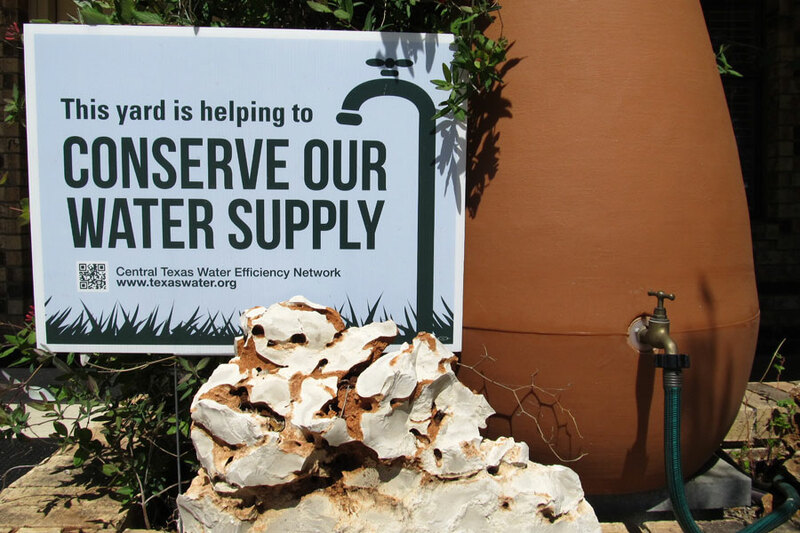 A group of Central Texas water providers, municipalities and water conservation advocates launched a yard sign campaign to urge residents to protect our region’s water supply by conserving water. 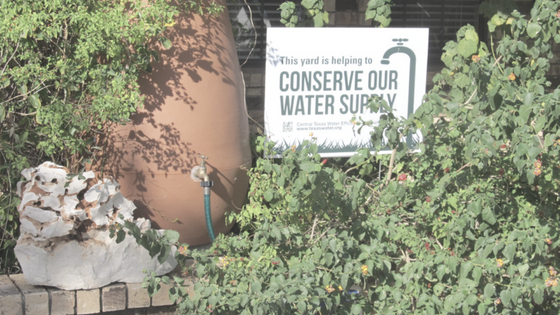 Residents and business owners can let others know about their commitment to saving water by placing a free “This yard is helping to conserve our water supply” sign in their lawn. The signs are available at 6 easy pick-up locations in central and south Austin, Round Rock, San Marcos and Bastrop. The District Headquarters is one of the pick-up locations for these free signs. Stop by! Pick up a sign and help us spread the word – Conserve! During the dry summer months, outdoor water demands lead to increased irrigation. 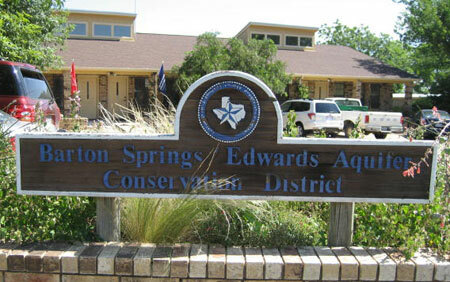 One way to cut down on water use outdoors (and on your water bill) is to choose native Texas plants for your landscape. These plants are adapted to a Texas’ climate and by design need less water. Pairing native plants with water conserving practices (rainwater harvesting, drip irrigation, mulching, composting, etc.) provides a homeowner a beautiful, distinctly Texas landscape that doesn’t require the amount of water and care of a non water-wise landscape. For more information on installing your own water-wise landscape, please click on the following links and documents. 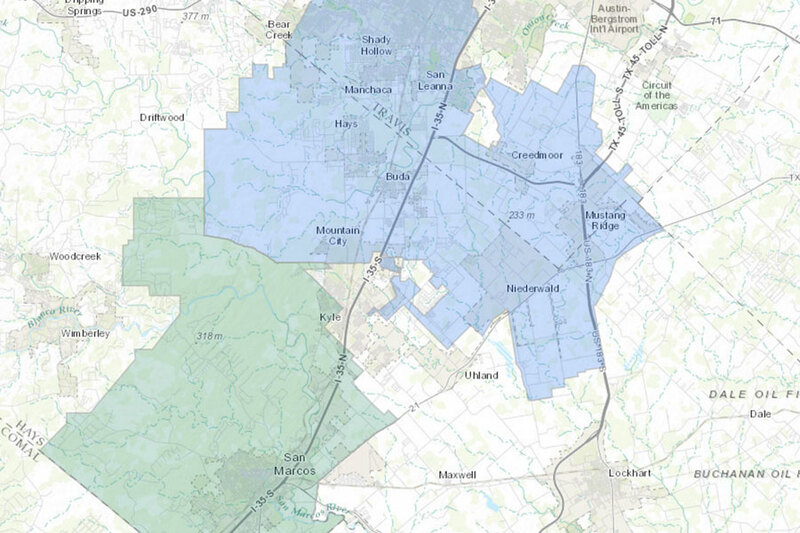 In addition, the District has its own water-wise landscape that can be toured upon request. Please contact the District office at (512) 282-8441 for further assistance. Regardless of the water used in your landscape, it is vital to be efficient in its use. 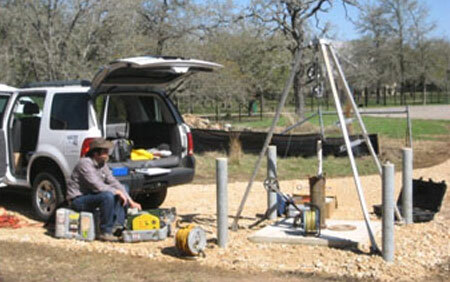 Licensed Irrigators can help you evaluate your irrigation system to ensure an efficient application of water. Here are simple, easy steps to auditing your irrigation system. Download an Irrigation Audit form (pdf) to help with your Home Self Irrigation Audit. Reducing the water applied to your landscape through maintaining your irrigation system is one component to reduce the unnecessary waste of water. The key to successful irrigation is understanding your system. Your eyes are the best tool. Do you know if all of your sprinkler heads are functioning efficiently? How often and how long does your system run? Does your system run when it is raining? Does your irrigation encourage deep roots so plants are prepared for drought? 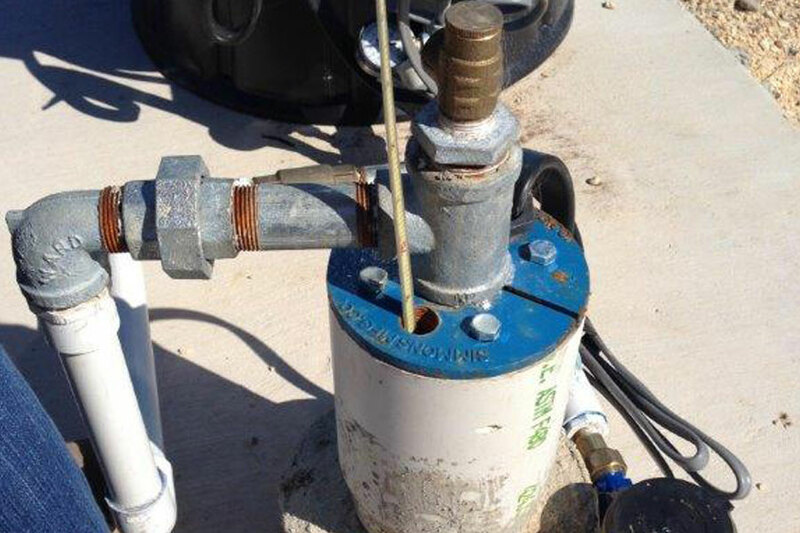 Common reasons for inefficient irrigation are broken sprinkler heads, misting heads, and overspray onto hardscapes. Take the time to watch your system run. These issues can easily be fixed. 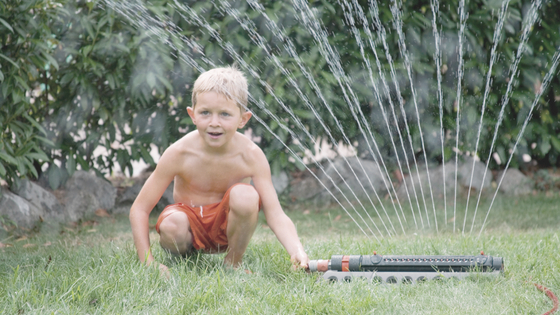 Your irrigation should not spray on sidewalks, driveways, fences or other hard structures. This can be fixed by adjusting the spray nozzles. Check for misting heads—this is a sign of too much water pressure. Check to make sure your sprinkler heads are not leaking water when turned off. This will reveal a broken seal. These easy steps will ensure your system is functioning properly. You are ready to check the irrigation rate of your system. 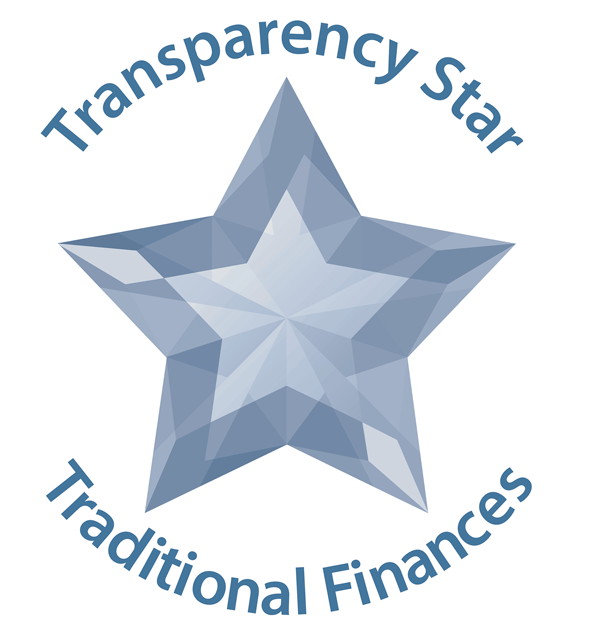 The most accurate determination of this rate is achieved by conducting a catch can test. Catch can tests measure the amount of water actually hitting the ground at various points in your landscape (see sidbar for more information). Calculate irrigation rates for each zone. Turn on your irrigation system, one zone at a time, to locate and mark sprinkler heads. Starting with zone one, position the catch cans in a grid-like pattern throughout the zone to achieve an accurate representation of sprinkler performance. Try not to place catch cans too close to sprinkler heads; this may alter your results. Turn on zone one, allow water to fill the catch devices. Keep track of the minutes that the zone is allowed to operate (5-10 minutes is usually sufficient). There is no need to fill the catch cans completely. This is also a good time to check each sprinkler head to make sure they are functioning properly. After a measurable amount of water has fallen, measure the depth of water (in inches) contained in each catch can. Record these values along with the minutes the zone was operating. Repeat the steps for each zone on your system. Determining when to irrigate is based upon the depth of the plant’s roots and the type of soil. Together, root depth and soil type define the amount of water needed. For example, a six inch deep clay soil will hold more water than a six inch deep sandy soil. Thus, the number of irrigations per week will be less in the clay, though the amount of water the plant needs will remain the same. Root depth also influences the irrigation frequency. Shallow roots need water more often than deeper roots. A common way to determine root depth is to take a core sample of your turf grass. You may purchase a coring tool at your local hardware store. In general, the height of your turf grass is equal to the root depth: a 3” tall grass will have a 3” root depth. Now you can use your irrigation controller to schedule for efficient irrigation. Understanding the irrigation components, the precipitation rate and run time of your system is an important component to efficient watering. Easily save water by changing broken heads, adjusting water pressure so there is no misting, and realigning the spray as to not water on your hardscapes. These simple fixes can reduce the amount of water wasted. Also, let your grass grow. Taller grass provides shade to the roots so they will be deep and healthy. Finally, take some time to watch your irrigation system while it runs to use water efficiently while protecting your landscape and outdoor spaces. If you have questions or concerns about your irrigation system, contact a local Licensed Irrigator to assist you in maintaining a beautiful, healthy landscape.